An embeddable social media aggregation tool lets users access information and content across platforms and interact with the athletes. 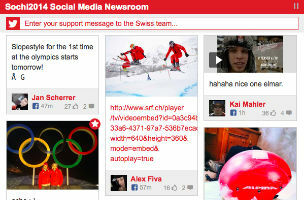 For the Sochi 2014 Winter Olympics, the Swiss Federal Department of Foreign Affairs has created a “Social Media Newsroom,” an embeddable social media aggregation tool to access, filter and display the social media streams of Swiss athletes, media, officials and fans throughout the Olympic Games. The newsroom page includes the latest news, pictures, tweets, posts and statistics, and lets users interact with the athletes via personal messages. The 2014 Winter Olympics are scheduled to take place Feb. 7-23 in Sochi, Russia. According to CNN, the lead up the games has evolved into a “distinctly negative narrative” involving security threats, gay-rights protests and corruption allegations as Russia attempts to forge a new identity on the international landscape through sport. From the students keen to take part in an event that could shape their future to those who have taken the opportunity to work in the new jobs created, there is a sense of excitement and pride. Russia, a country notorious for its autocratic government and stone-faced expressions, has historically driven fear and paranoia in many Western nations. Hosting the Winter Games is a grand welcome to the world to learn more about its culture and people, or to witness its grandstanding depending on your stance, a move that in itself is fascinating. The House of Switzerland is a unique meeting point and social hub located close to the sport facilities. House of Switzerland is also sponsoring a Facebook competition for Russian residents to win a flight for two people to Switzerland and a two-night stay in a deluxe Swiss hotel. Click here to access House of Switzerland’s social media widgets.